The replacement of the Phillips’ Mill Bridge in New Hope and the repair of the River Road Bridge near the Golden Pheasant Inn in Erwinna have required that the Delaware Canal towpath be closed at these locations. 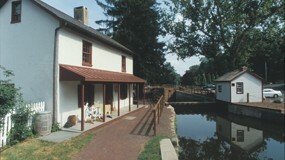 The towpath closure at Phillips’ Mill Bridge has disconnected the PA/NJ Canal Loop Trail that runs from New Hope, PA to Lambertville, PA to Stockton, NJ to Centre Bridge, PA. The towpath closure at the “Golden Pheasant” Bridge has disconnected the Loop Trail from Lumberville, PA to Bull’s Island, NJ to Frenchtown, NJ to Uhlerstown, PA. The detours around the closures are not recommended. LOWER MAKEFIELD, PA – A short section of the Delaware Canal towpath on the Pennsylvania side of the Scudder Falls Bridge is scheduled to be closed six days a week beginning Monday, July 30, the Delaware River Joint Toll Bridge Commission announced today. The scheduled towpath closure is needed to ensure public safety while construction activities take place on the approach bridge that carries I-295/I-95 across the canal. This work initially will involve mobilization activities and then expansion of the approach bridge’s abutment as a precursor to widening the roadway before the river bridge. The towpath is scheduled to be barricaded and inaccessible to the public from Woodside Road to the project limits downstream of the canal’s I-295/I-95 overpass Monday through Saturday of each week from July 30 until August 31. Under the current schedule, the towpath is expected to be open through the project area on Sundays only in the month of August. If all goes as scheduled, the affected towpath segment should be open for the Labor Day holiday weekend. The aforementioned closure periods are subject to change due to weather and other considerations. Pedestrians and bicyclists are urged to exercise caution when traveling along the canal near or through work areas as the bridge replacement project construction activities proceed over the next t years.